When I teach art, I try to always have scaling options figured out ahead of time so I can adjust the art project to make it appropriate for the wide range of skill and passion among my students. If you’re using an art lesson plan I’ve created, you’ll see the scaling options are already included. I hope this summary will help you better understand the ways art projects can be adjusted and give you the freedom to explore and change things up a little. If you’re creating your own art lessons, it’s a good idea to think about the skill and passion level of your students. I hope this summary will help you find a way to make your art project a perfect fit for your students! You mean “Age Range,” Right? You’ll notice I did not say these scaling options were for a wide “age range.” I don’t assign art projects to certain ages because a student’s ability to grow through an art lesson is based on his/her interest in art (passion) and previous practice using various art techniques and tools (skill). While interest and practice history can be related to age, they certainly are not solely based on age. The four and five year olds are especially interesting because their wide range of skill and passion seems to affect their determination more drastically than other ages. Last year, I had a few four year olds in our Classical Conversations (CC) community who were very determined to draw everything. It was amazing to watch their art skills grow over the year! So, remember that age is not an indicator of art skill or passion! Here are five ways you can adjust art projects for a variety of skill and passion. I’ll cover each one, discuss how to use it, and comment on when it seems to work best. To give you a fun bonus for this blog post, I created this quick reference sheet for you! Print this out and keep it in your art teacher binder. If you’re ever in the middle of an art project and your students are struggling more than you expected, pull out this Adjusting Art for All Skill Levels reference sheet and you’ll be able to change the project as you go! Tracing is a great way to give students some muscle memory for the object they’re drawing. You can use it as a gentle start to your semester, like we’ll do when we trace some American Landmarks. You could also use it to make a daunting task, like drawing a botanical, achievable. Another great use for tracing is as an option to prevent frustration. For example, in our Drawing Upside Down Ships lesson, there are step by step instructions for drawing an upside down ship, but there is also a full size version of the ship the students can trace. Tracing is great when you’re short on time, when interest level is lacking or when the students’ skill is just not there yet. Sometimes students are so new to art they haven’t even developed the patience or attention span to take art instruction yet. In these circumstances, we can let them color in a line drawing of a famous work of art. This helps them develop hand-eye coordination and fine motor skills, and helps them learn to recognize famous works of art. Plus, coloring is plain fun and therapeutic! Sometimes we use coloring as a way to focus on learning an art element or idea. For example, in our Lichtenstein lesson, students create oversized Benday dots so they can see the effect of pattern and white space. They also use only primary colors and discover the effect of contrasting colors. Another version of this is to have the students paint a line drawing of a famous piece of art so they can focus on painting techniques. This is exactly why we start with a line drawing of Christina’s World in our Andrew Wyeth lesson. We want to spend our time understanding how to mix neutral colors that will give our paintings depth. You can create your own line drawings of famous works of art by tracing the piece of art yourself, or you can find many of them online. Here’s a page where you can see all our line drawings of famous works of art! When a student is feeling impatient or doesn’t have high fine motor skills, an art project with a lot of detail can seem overwhelming. Many art projects that include a lot of detail can remain very effective with less detail. For example, when we’re using symmetry to draw the U.S. Capitol building, students have three drawings to choose from, each with a different level of detail. Similarly, in my FREE lesson plan, Drawing a Space Shuttle Using Symmetry, I’ve included both a simple space shuttle and a more complicated space shuttle with finer details. As students gain in experience and understanding, they will enjoy the challenge of a more detailed project. I find that I tend to reach for 8.5 x 11 paper for most of my sketching, but often it’s when I’m using my smaller 5.5 x 8.5 sketch book that I am most relaxed and enjoy sketching most. I think this is because it’s a little less daunting to fill a smaller piece of paper. It seems like this is true for our art students as well. 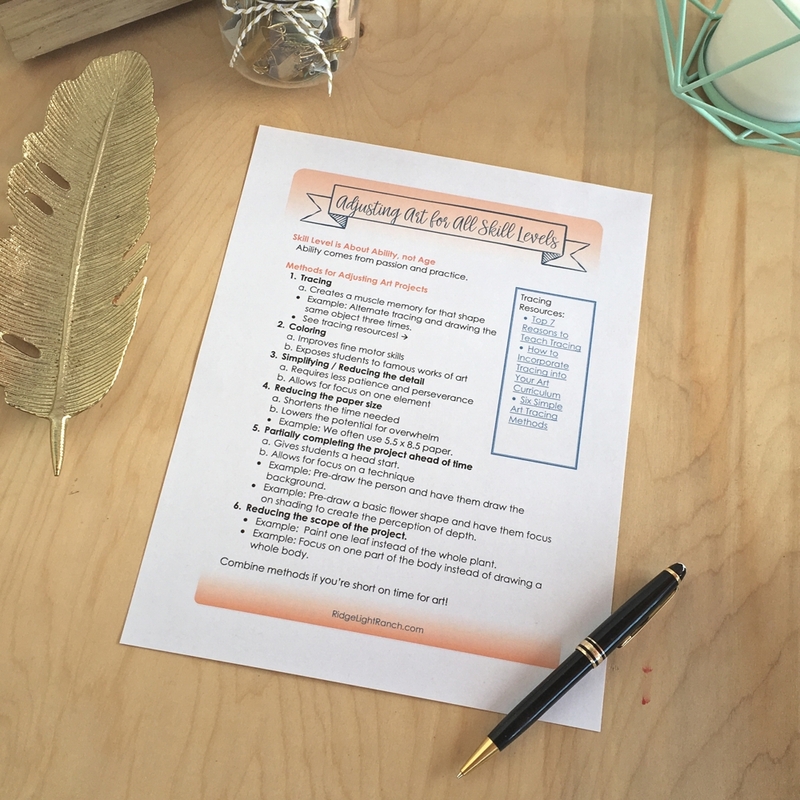 A smaller piece of art paper not only shortens the time needed to complete the artwork, but also lowers the students’ potential to get overwhelmed. In the classroom we frequently use something similar to the half sheet (5.5 x 8.5) of paper. The paper size seems to be most important when time is short! Certain subjects are especially difficult to draw because you really need to get the size or placement of your very first lines in the exact right spot. In these projects, you can give your youngest students a big head start by making those lines ahead of time. For example in my Gainsborough lesson plan, one option is to start with a light sketch of a boy standing in the middle of the paper and then just add your own landscape in the background. We’ll do something similar in our Andrew Wyeth and our Georgia O’Keeffe lesson plans. An art project with many different components can easily feel overwhelming. For example, if you’re drawing a botanical (a scientifically accurate drawing of all the parts of a plant), you’ll need to draw the flower, stem, leaves, roots, seed pod, fruit, and a cross section of the flower. Most of us wouldn’t even know where to start! However, if you reduce the project to drawing only a leaf, you can easily start there. 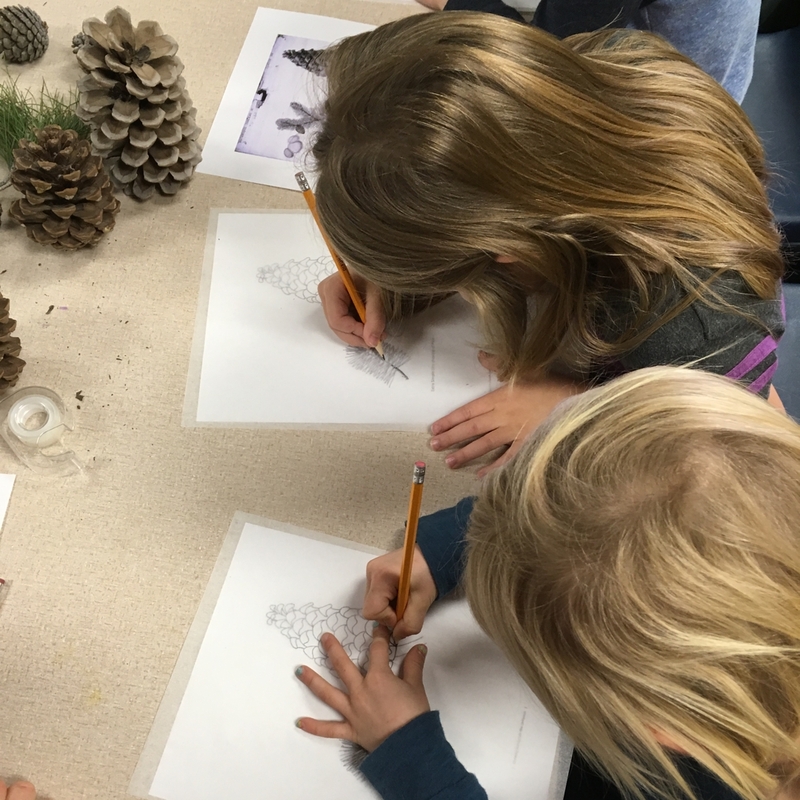 This is how we adjust our Carl Linnaeus botanical art project– we draw just a pine branch and cone. In our Rembrandt art lesson we can see this principle at work when we focus on drawing the eyes, eyebrows, and mouth to create different facial expressions instead of drawing a whole face or a whole person. In a recent art class I took, our instructor had us draw only the leaf margin (edge) of six different leaves so we would truly notice the differences and similarities of the leaf margins. In the end, if a 4 year old student can’t be convinced to work on the given art project, I’m fine with letting them draw what they want. I want them to understand that there are ways to improve their art skills and see those modeled so they know what to do when they are interested. Most importantly, I want them to enjoy art time! It’s tempting to think that each student needs a masterpiece to take home from class each day, but even for an experienced artist that’s not a reasonable expectation. The Classical Model of Education shows us that after we learn some grammar, we need to play around with it, struggle with it, and ask questions about it before we should ever hope to reach the rhetorical stage. 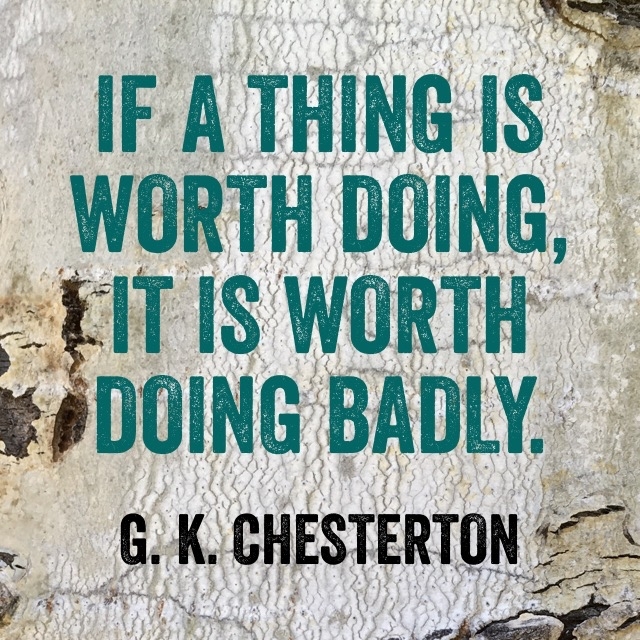 Have fun and remind your students (and yourself) that “If a thing is worth doing, it is worth doing badly” (G.K. Chesterton in What’s Wrong with the World, 1910).